Businesses of all sizes are being challenged by escalating customer demands and intensifying competition. These forces are driving them to find new tools to help them capture and analyze data from multiple sources so they can make the right business decisions. Traditional business intelligence (BI) systems have failed to meet these requirements. As a result, an increasing number of corporate executives and end-users are seeking easier to use and more economical Cloud-based analytics tools which can satisfy their needs. 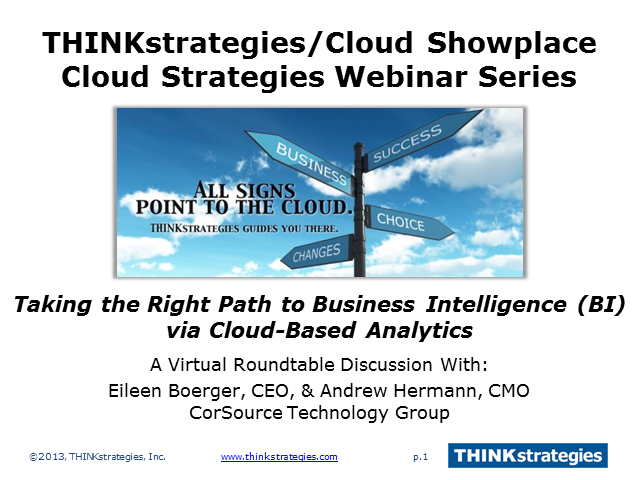 In this live 30-minute webinar, Eileen Boerger, President of CorSource Technology Group and Andrew Hermann, CorSource’s Chief Marketing Officer, will join Jeffrey Kaplan, the managing director of THINKstrategies and founder of the Cloud Computing Showplace, to discuss the key steps organizations should take to successfully select, deploy and utilize today’s exciting new Cloud Analytics solutions. - What makes Cloud-Based Analytics solutions different from traditional BI systems? - Why is it important to imperative to deploy Cloud-Based Analytics solutions in your organization? - How do you choose, install and administer a Cloud-Based Analytics solution to optimize its value? - What are the key considerations and planning steps for properly deploying and fully utilizing a Cloud-Based Analytics solution? Practical information and insight to help IT and business decision-makers make the right Cloud decisions; and help Cloud solution providers make the right go-to-market decisions.